Edge, Christopher. 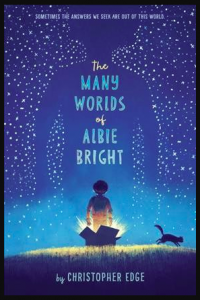 The Many Worlds of Albie Bright. New York: Delacorte Press, 2017. What happens when people die? Could they be living in a parallel universe? Grief stricken Albie, the son of two astrophysicists, embarks on a hunt to find his mother after she dies of cancer. With the help of a laptop computer, a box and a banana, he starts travelling the universe. Silly but also heartwarming, humorous but also thought-provoking, this British novel is highly recommended for readers 10 years old and up who enjoy science and speculating about the universe.